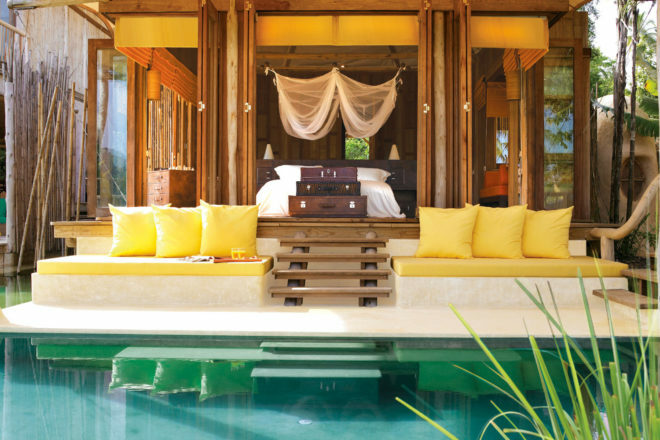 Soneva Kiri on Koh Kood, Thailand. The ultimate in barefoot luxury, Soneva Kiri resort overlooks a private bay on Koh Kood, Thailand, boasting serious sustainability cred too. Skirting a private bay on Koh Kood, a remote island on Thailand’s eastern coastline, a one-hour flight from Bangkok. This is the ultimate in barefoot luxury: overlooking a cove of silky soft sand and sparkling blue water which is surrounded by thick verdant jungle. The only way to get to Soneva Kiri is by the resort’s 16-seater plane, which lands on a private strip on an adjacent island. Everything here has been meticulously designed for minimal impact on the environment. From the 29 huge rustic-chic but sumptuously appointed pool villas clearly aimed at outdoor living and built from sustainably sourced timbers and bamboo, to the onsite reverse osmosis system and organic gardens growing vegetables for the multiple in-house dining options. Luckily, such eco-credentials don’t mean skimping on experiences, which here include dining in a bamboo ‘pod’ suspended from a tree, enjoying a movie at the open-air cinema, star gazing at the private observatory, playing tennis and volleyball in the jungle and having private access to several uninhabited beaches. It’s expensive, but a small price to pay for lowering carbon footprints in such comfort.